Struck by Myalgic Encephalomyelitis (ME) at 8 years of age, 12 year old Makayla Nunn has embarked on her second year of raising awareness and funds for Invest in ME (Research). 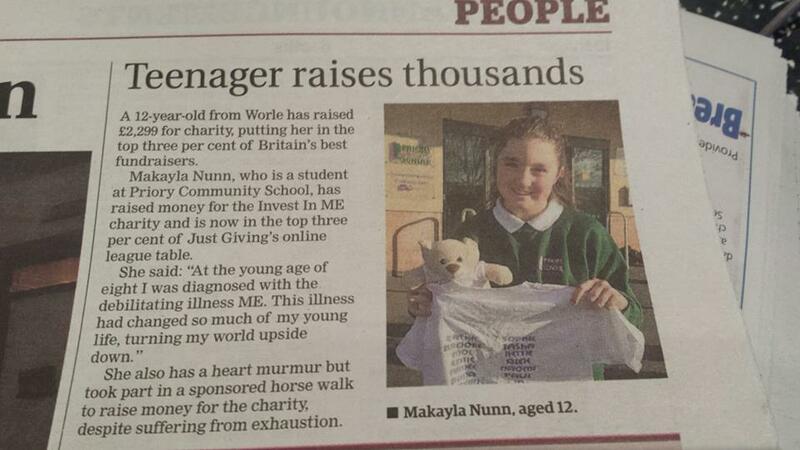 Makayla’s extraordinary efforts to support the charity in 2015 placed her in the top 3% of JustGiving fundraisers, as reported by the Weston Mercury last month and noticed by John Penrose, making the MP for Weston-super-Mare proud. 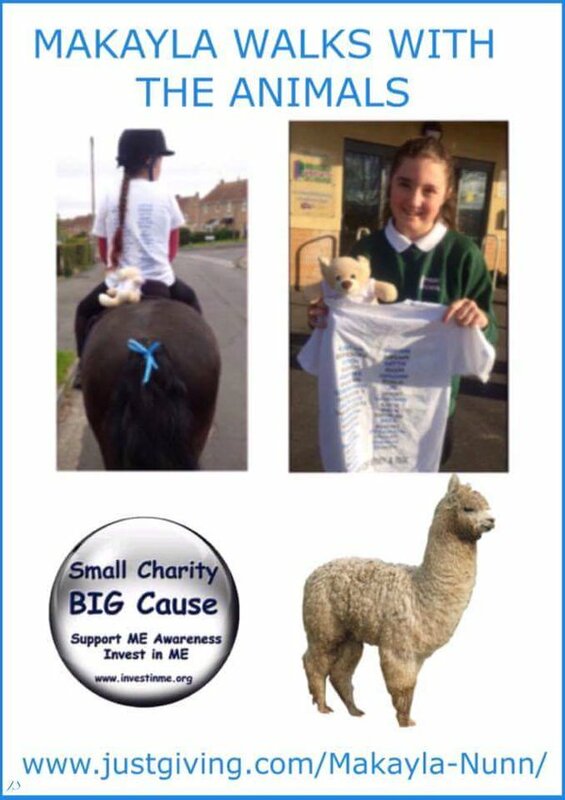 Makayla was pictured at Priory Community School, holding Let’s Do It for ME Bear and the T-shirt, featuring some names of supporters and fellow ME sufferers, specially designed for her May 2015 Horse Walk for Invest in ME. After an excellent start to secondary school on reduced hours in September, Makayla’s mother Michelle Nunn said that Priory Community School deserves recognition as a model of good practice for support of children with ME. Makayla won a Student of the Week Award, “Making her MORE POWERFUL THAN A MIGHTY STEAM TRAIN” according to actor Jon Campling. When Makayla was too ill to undertake any exertion other than watching films she had seen before, her favourite was Harry Potter, so imagine how delightful to be encouraged by a Death Eater! 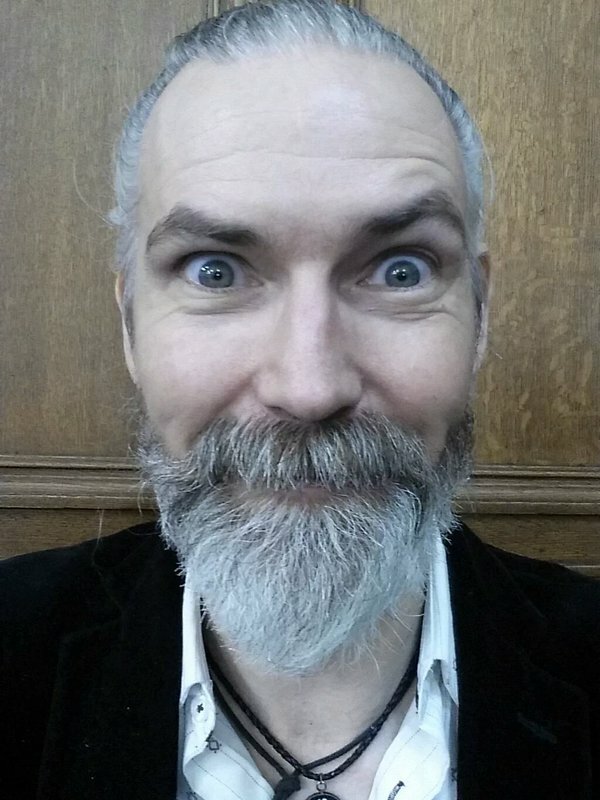 Jon Campling described the picture Makayla painted and auctioned for Invest in ME last year as AMAZING. Art was another activity Makayla was unable to do during her worse phase of illness, so she went wonderfully wild with her colourful zebra, very apt in support of a charity leading the field in organising and funding cutting edge research for tests and treatments for the illness that “cruelly crashed” her fun loving young world. 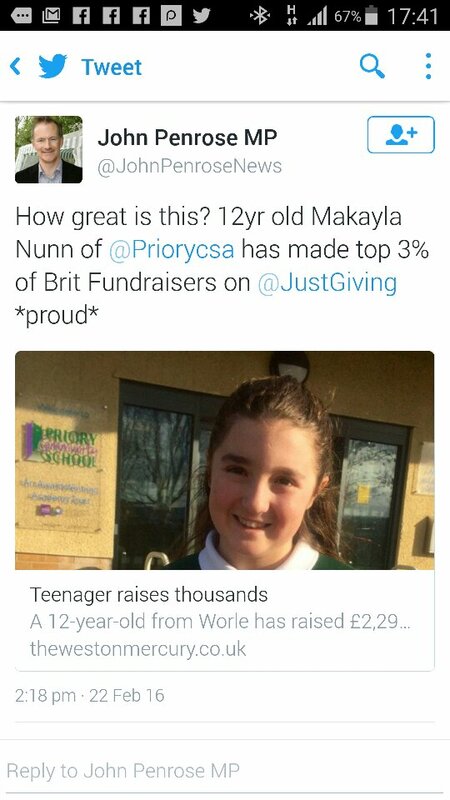 Makayla’s efforts have also been kindly noted on Twitter by journalist and TV presenter Matthew Wright, and actress Linda Robson. 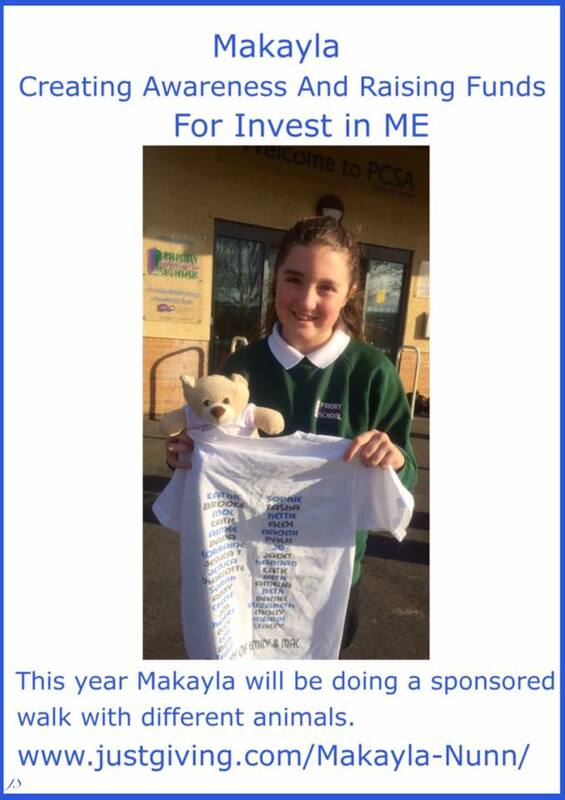 If you would like a zebra picture personalised with your name to share online as a thank you for your support of Makayla’s 2016 awareness & fundraising for the charity Invest in ME Research, please contact Michelle Nunn. You can find Makayla’s Fundraising for ME on Facebook, follow Michelle Nunn on Twitter, sponsor Makayla on JustGiving or text WFME76 (£1-£5 or £10) to 70070. Following on from her successful Horse Walk for ME 2015, Makayla plans a number of walks with different animals this year, starting with .. an Alpaca! Move over Doctor Dolittle .. here comes little Miss Doalot! To adopt a Let’s Do It for ME Bear visit our shop on Spreadshirt. Big thanks to this little girl & everyone supporting! 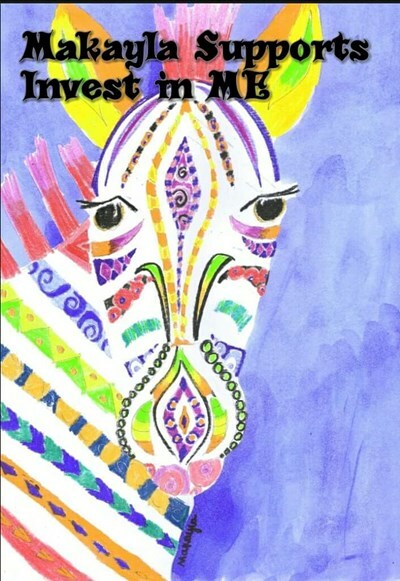 5 Pings/Trackbacks for "Makayla Walks with the Animals for Invest in ME"